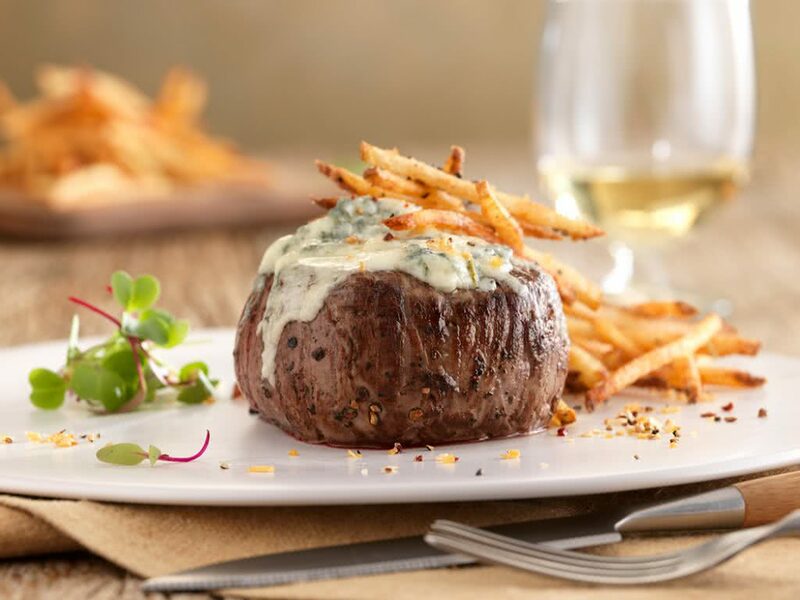 Crusted bleu cheese adds a stunning tangy flavour to a juicy bison filet. It’s an easy recipe with a beautiful presentation that pairs wonderfully with French frites. Melt 1 tablespoon of the butter in a large heavy skillet over medium-high heat. Sprinkle both sides of steaks with salt, and a generous amount of ground black pepper. Add to skillet and cook on one side for the time listed on our Bison Steak Cook Time Guide. Transfer steaks to a broiler pan with the previously-cooked side facing up. Top each steak with 1 oz. bleu cheese. Place on top rack of oven, and broil until a light crust forms on the cheese (about 5 minutes). Remove from oven, and place on a serving platter; keep warm. In the same skillet you cooked the steaks, return to medium-high heat and add remaining 4 tablespoons of butter. Melt butter, and cook until it begins to turn a light brown color. Remove from heat, and spoon over crusted steaks.